We discuss insurance, Types of insurance: Liability Health & Dental Life Disability Crop Vehicle Earthquake Why get insurance? Insurance Terminology Policy: The contract / document Premiums: The money you pay to the insurance company Coverage: The amount of money the insurance company pays if the bad event happens. Deductible: The amount of money you must pay before the insurance company pays. Co-Payment: The amount of money PER VISIT (to the doctor) that you pay. 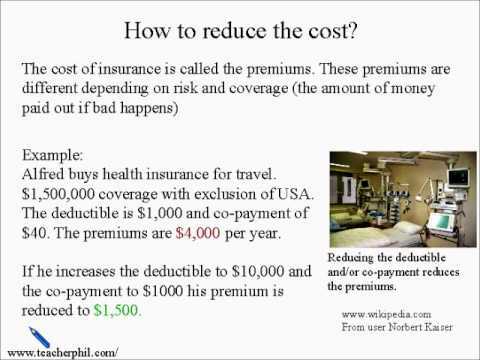 Exclusions: What the insurance does NOT cover How to reduce the cost? Видео Business and Finance Lesson 10: Insurance (Learn English) очень пригодится тем, кто хочет выучить английский язык. HEY PHIL!!! Parlez-vous fran?ais? lol ..I don't know why I keep commenting? random stuff..